IMF policies and conditions on which it gives loans has damaged healthcare systems in African countries and led to a shortage of doctors and nurses, and therefore, to a weak response to the Ebola outbreak, Professor Lawrence King told RT. 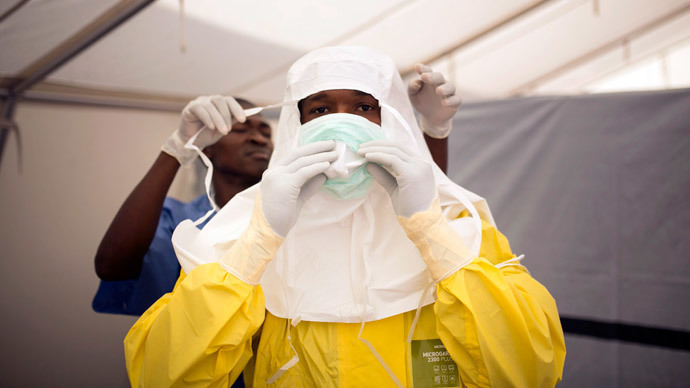 Researchers from Cambridge University published anarticlecriticizing IMF policies in the countries hit by the Ebola virus, in particular Guinea, Liberia and Sierra Leone. One of the authors, Alexander Kentikelenis, said that “policies advocated by the IMF have contributed to underfunded, insufficiently staffed, and poorly prepared health systems in the countries with Ebola outbreaks.” The IMF responded to the accusations by saying that the health systems in Sub-Saharan Africa “have improved significantly over the past decade or so,” and their policies were as effective as they could be given the pressure created by the outbreak of Ebola. RT talked to Lawrence King, one of the authors of the research on IMF policies in Ebola-hit countries, to get more details on the issue. RT:The IMF says all three countries were doing relatively well when Ebola broke out - which kind of contradicts your own findings. What would say to this? Lawrence King: The IMF is being disingenuous, I would say, as they often are when criticized. RT:In recent months the IMF has announced $430 million of funding to help combat Ebola in West Africa. Why isn’t that enough? LK: The Ebola outbreak certainly wasn’t caused by IMF programs, but one of the major factors in the outbreak was the weak health system. The IMF has been operating in the area for about two decades. The IMF is talking about the loans that it has given very recently, in the last few years, but really what we wrote about in our article was the culmination of the long process. RT:Why are you blaming the IMF's policies in West Africa when Ebola has reached countries with more advanced health care systems? LK: We are not blaming the IMF for the Ebola outbreak. The point we are making in our article is that the IMF contributed to the Ebola outbreak and to the weak response to the outbreak. They did it in several ways. The IMF is lender of last resort and in order to qualify for an IMF loan countries have to agree to do certain things, these are referred to as conditionalities. The conditionalities which the IMF attaches to its loans and has attached to its loans over the last 20 years, really since the early 80s, have been damaging to the health systems. They are free market fundamentalist policies which don’t work very well with healthcare or with medicine. One of the policies that the IMF has pushed in these countries has been a limit on a number of employees that can receive state support – so the number of state workers. An effect that it has is that doctors and nurses cannot be paid. There is not really a private sector that can pay them there. Even if there is money to pay doctors and nurses and other medical staff, they are not allowed to be employed by the conditions that the IMF attaches to their loans. This has led in these countries that have very weak medical systems.